It seems readers never tire of dark tales designed to leave us with sweaty palms and racing hearts. 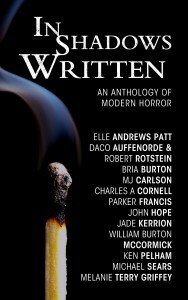 So when I was asked if I was interested in being one of the twelve award-winning writers whose work would be featured in a new horror story anthology, I immediately said yes. And I knew exactly which of my short stories to submit. 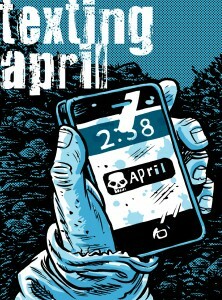 Texting April won a Royal Palm Literary Award a few years back, and I later included it in my own collection of dark tales, Ghostly Whisper, Secret Voices. I thought it would be the perfect complement to the other stories to be found in the collection titled, In Shadows Written. In my story, technology is pushed beyond the limits of natural laws when young Nick receives a text on his iPhone purportedly from a girl who was murdered. The story fits nicely with the other stories by these fine authors: Ken Pelham, Familiar, Elle Andrews Patt, The Legend of Johnny Bell, William Burton McCormick, The Antiquary’s Wife, Michael Sears, Kev, Jade Kerrion, Insecurity Complex, Bria Burton, A Dream Within A Dream, Melanie Terry Griffey, Gabriel, Daco Auffenorde and Robert Rothstein, The Alexandrite Necklace, John Hope, Beating Cats, M.J. Carlson, Three, Two, One, Wake Up, and Charles A. Cornell, Die Fabrik. You can pick up the digital anthology for less than a cafe latte at Amazon.com by clicking here. It’s best to read these stories in the daytime, or at least with the lights burning brightly.